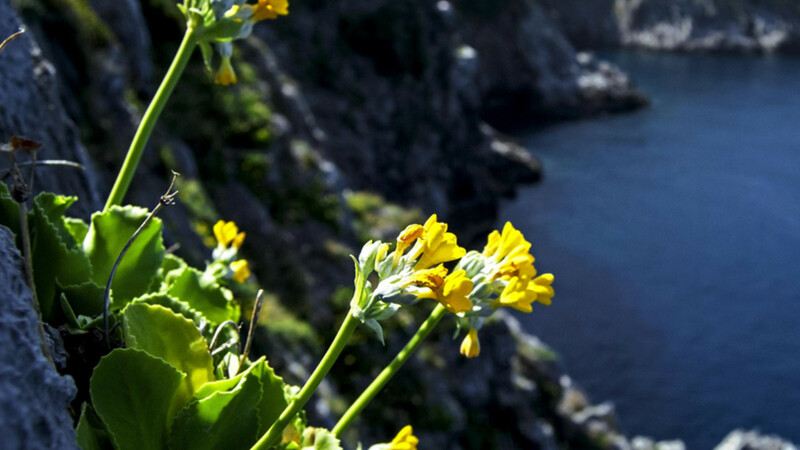 There are at least 1.800 plant species, many of them endemic or rare such as the Palinuro primrose, symbol of the National Park, and the wild orchid of San Giovanni a Piro. Centuries-old olive trees dot the sparse coastal lowlands and the gentle hillsides. Hundreds of animal species, such as the Apennine wolf, the hawk, the eagle and the otter inhabit this extraordinary natural environment. 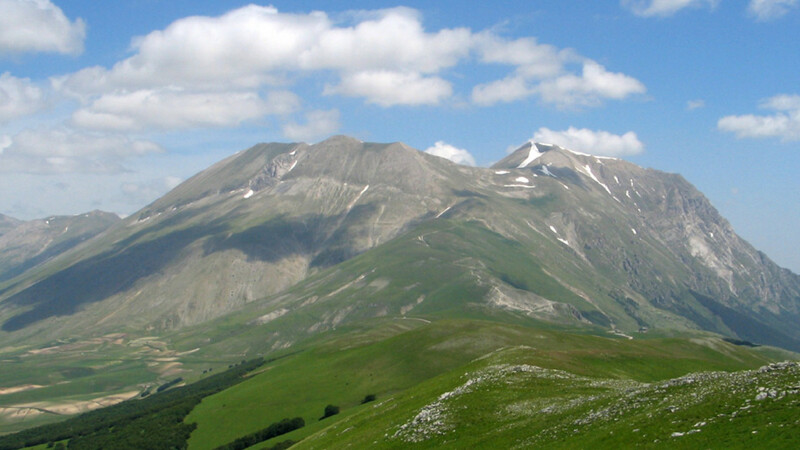 The main peaks are the Alburno (5,715 ft), the Cervati (6,227 ft) and the Gelbison (5,594 ft). The calcareous quality of this mountain range is responsible for the formation of scores of impressive natural architectures and sculptures – over millions of years water has been funnelled inside the rock shaping magnificent caves and grottoes (about 400 caves have been listed so far). 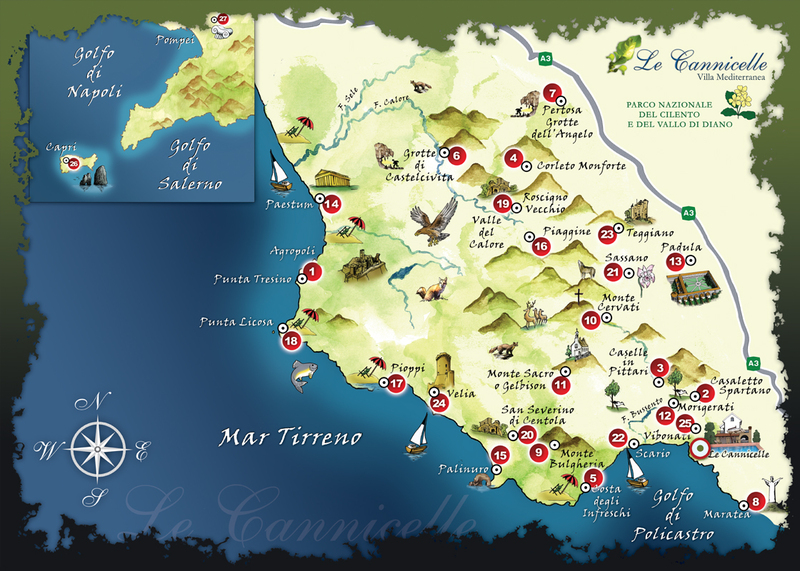 The caves “Grotte di Pertosa” and “Grotte di Camerota” are two superb examples of this phenomenon. The historical and cultural importance of this area is testified by the presence of architectonic and religious evidence scattered all over the area, which shed a light on the millenarian history of the present inhabitants’ ancestors – relics dating back to prehistoric, Lucanian, Greek and Roman ages. This is the land where western civilization has its roots. 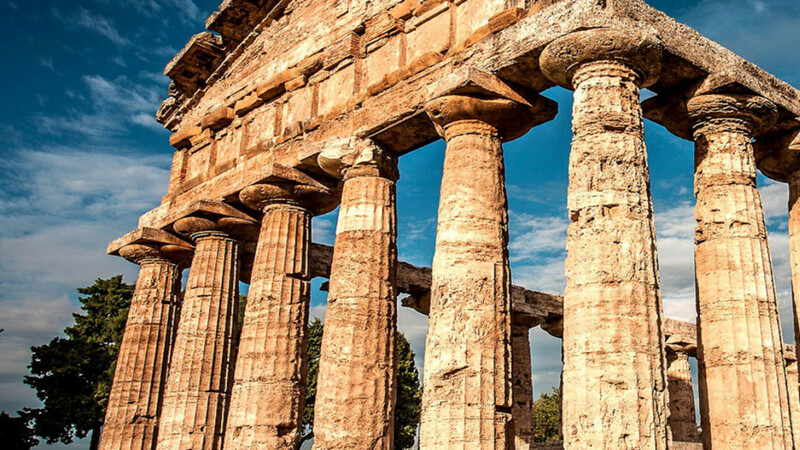 The Greeks settled here in the VII century BC and celebrated the splendour of their colonies: superb examples are the grand Doric temples of Paestum and the ruins of ancient Elea. This was Magna Graecia (Latin for Greater Greece), and here was the birthplace of the Pre-Socratic philosophers Zeno and Parmenides and the Eleatic school (V c. BC). Byzantines, Longobards and Normans have left castles, churches, monasteries, and cloisters, lavishly decorated with fine works of art. The inland settlements, in particular, are characterised by distinctive medieval buildings like cathedrals, castles and fine palaces. The Certosa of San Lorenzo, at the foot of the hill of Padula in the Vallo di Diano, is one of the world largest monasteries and one of the most valued for its architectonical grandeur and profusion of art works. 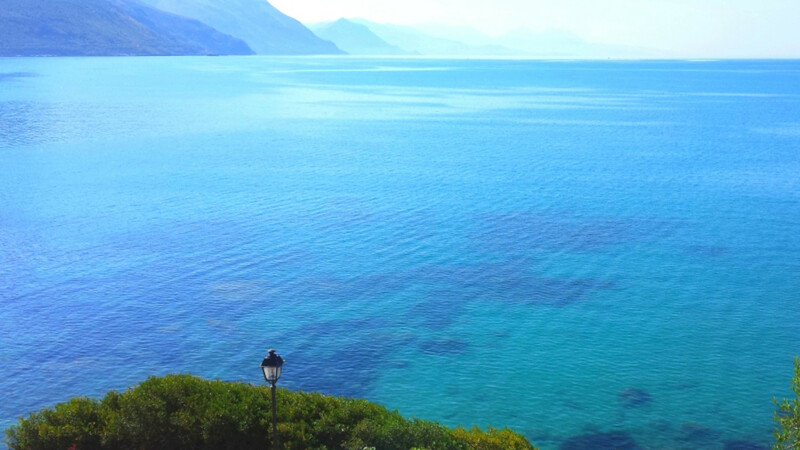 The Park takes in one of the most attractive strip of the Tyrrhenian coast swathed by the vivid colours of the Mediterranean flora. 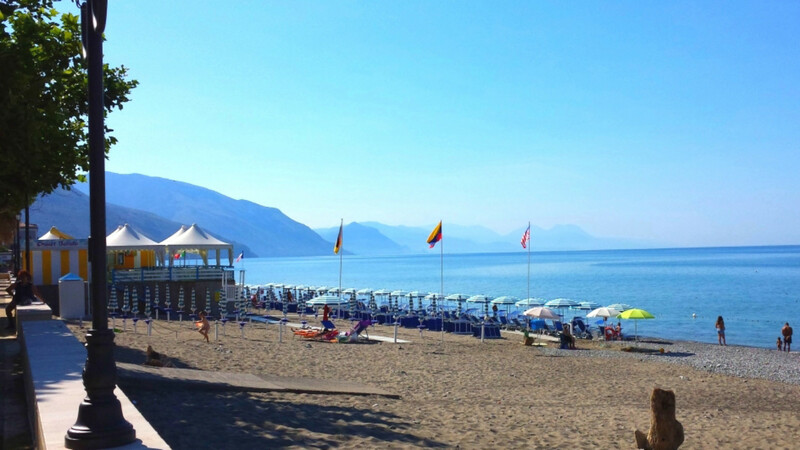 Long sandy beaches, a colourful seafront fringed with palms and eucalyptus trees, small restaurants, cosy venues and cottages make of Villammare the perfect seaside resort for travellers from all over the world, in search of friendly and charming spots off the beaten track. 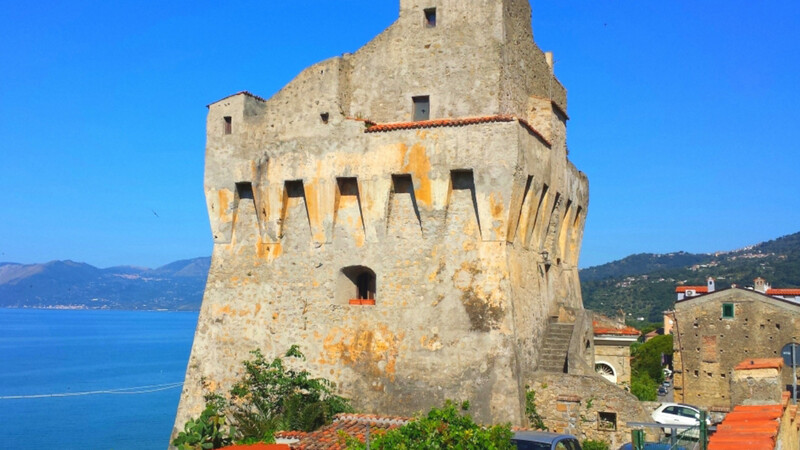 Breathtaking views from the hills covered with centuries-old cork oaks, trekking the mountains and cruising along the Cilento coast, mouth-watering regional cuisine and the special friendliness of the locals captivate visitors all year round.